Bobby Bolin - After 1032 Days!!! I'm exhausted now. 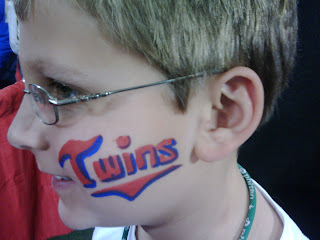 I've had a nagging head cold for a week and it wasn't pleasant to be sick during TwinsFest. Sitting in line is okay, but carrying my bag up and down the Metrodome stairs has taken its toll on me. All in all, we did pretty well today. It was less crowded, and we planned well, so we got the players we wanted. As always, when we get home we put all of our autographs on the dining room table and take a picture. We counted a couple times and came up with different answers, but I think we got 90-95 autographs. My sons each had a red Twins cap that they got several autographs on. My older son ended up with 17 on his. The signatures include current and former players as well as coaches and Gardy. No Morneau or Mauer again this year for us. Although my older son tried on Friday night, he was unsuccessful. We didn't try again after that. While we got a lot of autographs, the no-shows were pretty disappointing: Punto, Swarzak, Jim Perry, Killebrew, Blackburn and Mijares. Maybe there were more, I can't remember. I get to get up at 4:00 a.m. tomorrow to fly out on business, so there's no time to take pictures and scan all of our items. I'll start that process next weekend and post what we got. My son got through the Nathan/Pavano line and I got through the Blyleven at about the same time. We're taking a little break for my son to eat. I think he and I are done getting autographs, but my wife and other son have another line to go through in the last signing period. We all got through the Kubel, Young and Hardy line already. Now I'm waiting for Blyleven while my son is in line for Nathan and Pavano. My wife and other son are experiencing a 20 minute wait for hotdogs because they ran out. I got Kubel on a game used bat and ticket from the game he hit for the cycle. We got through the Casilla, Liriano and Slowey line and are back in line for Kubel, Young and Hardy. While I hold our place in line, my older son is getting Koskie, Tom Johnson and Jesse Crain. Blackburn was supposed to be in that group too. I'm not sure if they replaced him or not. My wife took my younger son to get his face painted. It's going pretty well so far. My son got Gardy and Kelly at one station. Then Span, Ulger and White at another station (twice). Now we're about 20th in line for Liriano, Casilla and Slowey. After that we're getting in line for Kubel, Young and Hardy. Overall, not a bad day for the two of us. Carew x2, Blyleven x2, Molitor x2, Nathan x2, Oliva x2, Morris x2, and a few others. My feet and back are killing me. Even my 12 year old's ankle hurts. One more day tomorrow when I hope to get Kubel on a game used bat and Delmon young on a bobblehead. No Hall of Famers tomorrow, but I will try to get Blyleven for a friend (I consider Blyleven a Hall of Famer). We just got through the Molitor line where we both got mini helmets signed. Now we're standing in line for Joe Nathan where we're both going to have him sign a 2009 All Star Game ball. My son was able to get through the Morris and Oliva line twice, getting himself an Oliva bobblehead signed and a 2005 Donruss Diamond Kings signed by Morris. On his second trip through, he got me a Wheeldon portrait signed by Oliva and a ball signed by Morris. 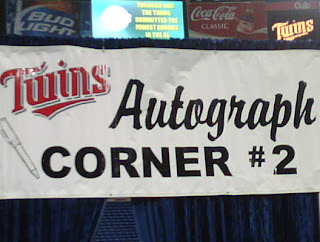 Now we're waiting for the Molitor line to start in about 15 minutes, then we'll see if we can make it to Nathan's line. We just got through the Blyleven line. I had him sign a Twins program from 1973 with him on the cover. My son had him sign a photo of him from early in his career. Blyleven asked us if we wanted it made out to anyone. My son likes photos inscribed to him so he took him up on the offer. I just had him sign my program with no personalization. Now I'm getting back in the same line to wait for Molitor who doesn't sign until for another 3 hours. My son is off to get Tony Oliva and Jack Morris. Hopefully twice, and then will join me in Molitor's line. While we're waiting in line for Blyleven, my son ran down to the floor and got Guerrier, Casilla (who showed up today) and Kubel. He got Kubel to sign a ticket stub from the game in April where he hit for the cycle with go ahead grand slam against the Angels. Kubel inscribed it with "cycle" without my son requesting it. Our silver lining for the day is that they have 2 for 1 hotdogs today. My son and I both got Carew on our John Wheeldon portraits. Carew was $30 this year. Not a bad price still, but still an increase over last year. I'm noticing that it's harder this year to get to more than one station per signing period, and the stations with the "regular" players are harder to get through. 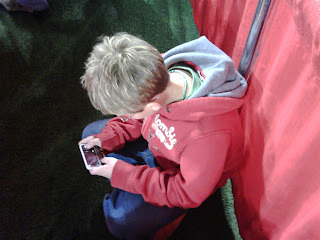 My older son and I just got in the Dome for Day 2 of TwinsFest. We got in line for Carew who is signing in the second time slot of the day (11:00). My son went to go put our coats in some seats and then is heading down to the floor to go through a line with Pirdie, Raabe, Stelmaszek and Greg Olson. He mostly wanted Olson to sign his Sports Illustrated with the picture of the collision between him and Gladden (already signed by Gladden). 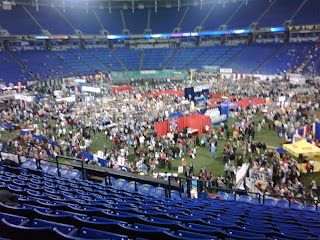 Day one at TwinsFest was s little disappointing. The prices are a bit higher, and the no shows were pretty bad. Those included Nick Blackburn, Jose Mijares, Jim Perry, Nick Punto, Anthony Swarzak and of course Harmon Killebrew. I did get a really nice signature on a bat from Michael Cuddyer, and Joe Nathan on a jersey. My J.J. Hardy ball get smudged in transit, so I'll shoot for getting another one today. Today it's just me and my older son. It's too crowded for my wife and younger son do they're staying home. Just got through the Nathan and Gardy line. I had Nathan sign a jersey and Gardy signed my team ball on the sweet spot. 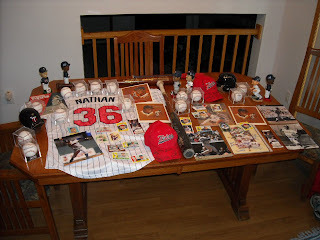 My son and wife didn't get Morneau, they were about 30 people back from where they cut off the line. Jim Perry apparently was a no show too. My older son and wife have been shut out so far. We got through Hardy's line quickly and decided to get in line for Nathan and Gardy rather than wait around for Span. Span was supposed to sign with Punto, but Punto had wrist surgery today. So far the no-shows are disappointing. Of course, Killebrew couldn't make it either due to his surgery. I have a jersey for Nathan to sign, and it looks like we'll get through his line with no problem. My younger son and I already got Guerrier, Crain and Baker and are in line for J.J. Hardy. Mijares and Blackburn are supposed to sign with Hardy but aren't here. My older son and my wife are in line for Morneau. They're aren't sure if they'll get him or not. 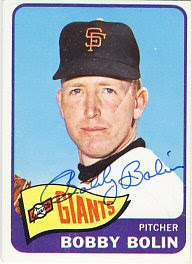 In my post about my 2009 Stats, I mentioned that one of my outstanding requests was for Bobby Bolin. Today, I received a Bobby Bolin return, but it wasn't the one I sent out last year. It was the one I sent out on March 30th, 2007! My sase had a 39 cent stamp on it but made it back okay. 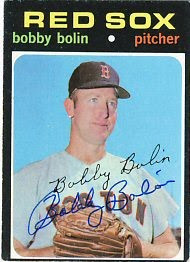 Mr. Bolin was kind enough to sign his 1965 and 1971 Topps for me. I have sent to him a few times, so I still have two outstanding requests out to him. These were sent in October of 2007 and the one I sent last year in March. I wonder if I'll get those back. I had given up on getting him through the mail, so I sent in to a paid signing, at GateX I believe, to have him sign his 1965 Topps for my set. Now I have 2. I may end up with 4 eventually! 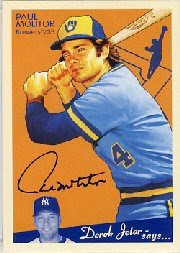 In addition to the two cards I listed yesterday, I also had one more item in my mailbox when I returned home this week. 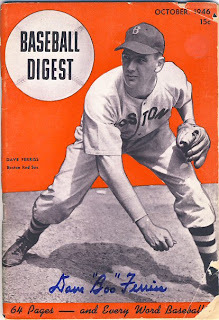 Dave "Boo" Ferriss signed the cover of a 1946 Baseball Digest for me. I have been trying to find his 1949 Bowman for some time and haven't had any luck. When I saw this magazine on eBay, I bought it right away. I think we're pretty well set for TwinsFest. It will be a busy weekend! This is the 300th post to my blog since starting about 15 months ago. Lately I don't seem to have as much time to post or even send out requests ttm, but hopefully that will change. I came home this week to find a few requests in my mail box. 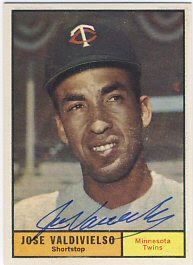 First, I received my 1961 Topps signed nicely by Jose Valdivielso from the signing put on by BaseballHappenings.net. 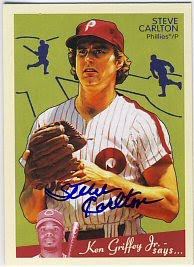 Also, I received my Steve Carlton autographed 2008 Goudey that I sent in care of Game Winner Sports. That makes 29 retired players that I have on that set, including 26 Hall of Famers. The schedule is out for TwinsFest. So far, nothing too interesting, but it still looks good. They split up the Mauer and Morneau signings so maybe there's a chance to get at least one of them. Jim Perry and Mudcat Grant are also scheduled to appear. We saw Mudcat last year, but haven't seen Mr. Perry before. Today my sons and I are going to organize our binders to match the players in the order of the schedule. I will be away for about a week. I hope to come home to a mailbox full of autographs, but that's not likely considering I haven't sent any out. I did receive a Michael Cuddyer game used bat that I bought on eBay which I hope to get signed at TwinsFest. So far, no surprise guests listed for TwinsFest, just the regular, local retired guys as well as Molitor, Carew and Killebrew. Not that I can't find enough to get signed by them, but I was hopping to get a few more 1987 players to sign their bobbleheads. Maybe Jeff Reardon? I might start a 1987 team ball for those players that I already have on their bobbleheads. I didn't come anywhere close to my goal of sending out 365 requests in 2009. I only sent out 155. I had a 95% success rate, meaning I had 1 failure and am still waiting for 6 requests. The failure was Jack Dittmer, who sent back my 1954 Topps unsigned. After seeing other successes on SCN, I re-sent the request and received it back signed. The six requests I'm still waiting for include Steve Carlton, which I just sent out in mid-December to Game Winner Sports, and who cashed my check, so I expect that back at some point. The other five I'm still waiting for include Les Moss (sent in November), Joel Horlen (sent in August), Bobby Bolin (sent in March, and who I got at a paid signing later in the year), Sandy Valdespino (sent in February) and Pedro Gonzalez (sent in January, but I bought a signed card on eBay). In order to get many more requests out this year, I'll need a new project. I am contemplating the 1978 and 1985 sets. I have complete sets of both. I really enjoy collecting the older players though, and might concentrate and getting more vintage cards signed by players I already have. I should focus hard on my 1958 and 1965 Topps sets as well, and go hard after those living players I don't already have. I will probably also go after a few more multi-player cards. 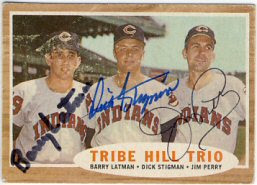 I completed the 1962 Tribe Hill Trio card this year, which I really like. 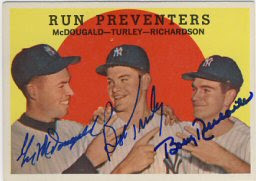 As well as the 1959 Topps Run Preventers card. I spent a lot of money this year on paid signings. Too much. I did make nice progress on my 2008 Goudey set of retired players, and will continue working on that. I don't intend to spend much time or effort on current players, other than Twins. 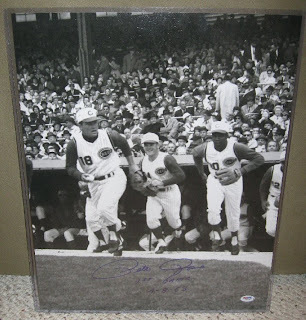 I received another of my recent bargain purchases in the mail: a 16x20 signed picture of Pete Rose running out of the dugout in his first major league game. I got this for under $40 shipped on eBay. I did a lot of sorting of cards in preparation for TwinsFest. The Twins have a list if attendees on their site and so far there's nobody out of the ordinary attending. I was out of town most of this week but came home to find a few returns and some purchases in my mailbox. I got a couple of ttm requests back after a few months wait. 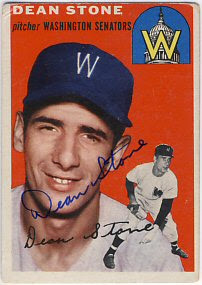 Dean Stone signed his 1954 Topps which I sent out about 5 months ago. 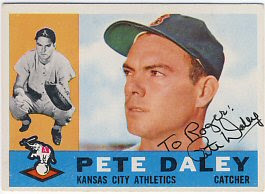 Pete Daley signed and personalized his 1960 Topps in about 3 months. 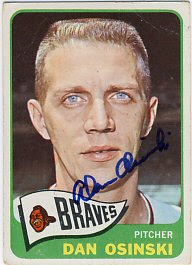 I also received a 1965 Topps signed by Dan Osinski which I bought from GateX autographs. They included a list of signed cards for sale with my last send-in order with them. I got this card for just $5. 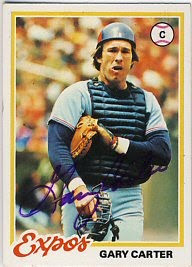 Finally, I received a 1978 Topps, PSA/DNA authenticated, that I bought on eBay. $6! During the holidays I spent a fair amount of time on eBay. I picked up a few bargains, probably due to low traffic on eBay. I received one of my bargains late last week: a PSA/DNA authenticated Frank Robinson signed ball with HOF inscription. I picked this up for less than $50 including shipping. I already have one, but this one looks a little nicer (believe it or not). 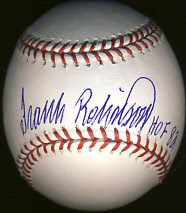 Mr. Robinson tends to sign baseballs following the line of the stitching, as opposed to straight across the sweetspot. I tried looking for the cost of his autograph at upcoming signings on SigningsHotline.com, but didn't see anything listed for him. I believe his fee is usually in the $75 range, and an extra $15 or so for inscriptions. I also received my 2010 Address List from Harvey Meiselman today (http://www.sportsaddresslists.com). I bought just the baseball list because that's about 99% of what I send out. The lists costs $35 and includes email updates. I easily save $35 per year by not sending to bad addresses. If you're sending requests through the mail, this is something you absolutely need to have. Not much coming in the mail other than eBay purchases in preparation for TwinsFest. Still no list of attendees on the Twins' website, and also no mention of the Twins Caravan. I bought a Paul Molitor Goudey Graphs (certified autograph) on eBay rather than try my luck at TwinsFest. He signs occasionally through the mail, but I thought I'd buy one so if I do have the chance to get his autograph at TwinsFest, I can get it on something better than a card. Not sure what that would be yet though. Maybe a HHH Metrodome Commemorative ball?